« What is Australian Food? 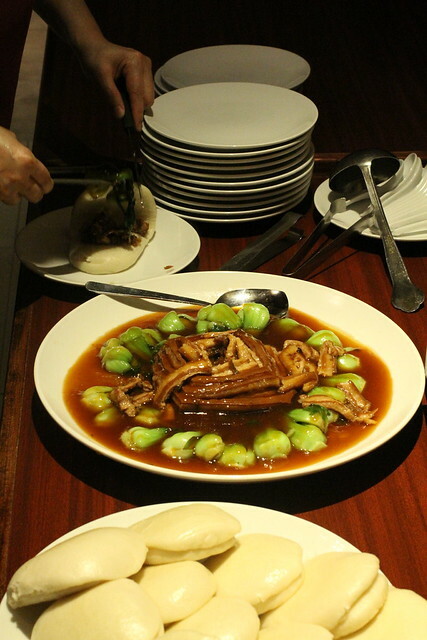 Good Taiwanese food has always been a fleeting category. Great restaurants and chefs have come and gone throughout my whole life in New York City. It is because of this that I am almost always more excited about finding a Taiwanese eatery than say, a great Cantonese restaurant. 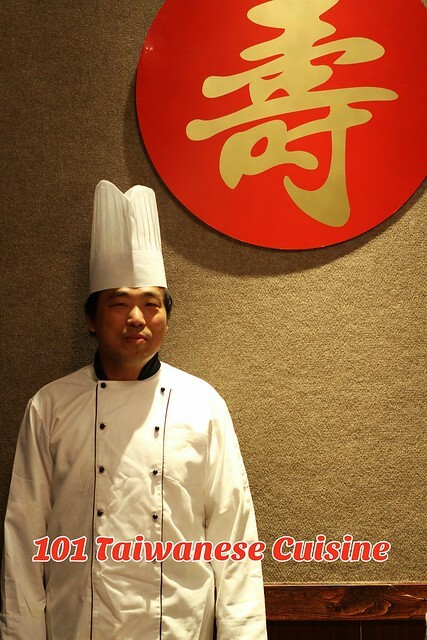 My expectations were set high when I heard that Chef Guo, a well-known chef from Taiwan, was now here at 101 Taiwanese Cuisine 135-11 40th Road, Flushing, NY 11354. My mom set-up a ten person banquet style dinner. It was certainly a strange surprise to see Chinese food beautifully and thoughtfully plated, yet flavors were mostly muted. The one flavor exception was Duck and Ginger Soup where the ginger was so overboard that the soup became bitter and medicinal. Overall the food is quite the opposite of how I would describe most of Chinese food, which is often ugly with delicious, strong umami, and other powerful flavors. 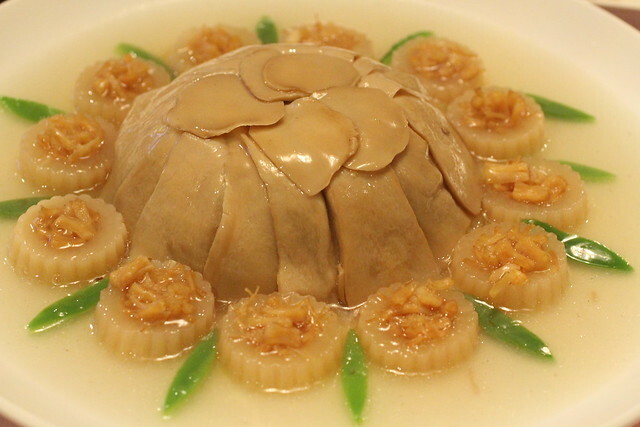 Take for example this beautiful dome made of mushrooms with perfectly arranged leaf-carved peppers and daikon flowers generously filled with dried scallop. Alas, this dish was just bland. 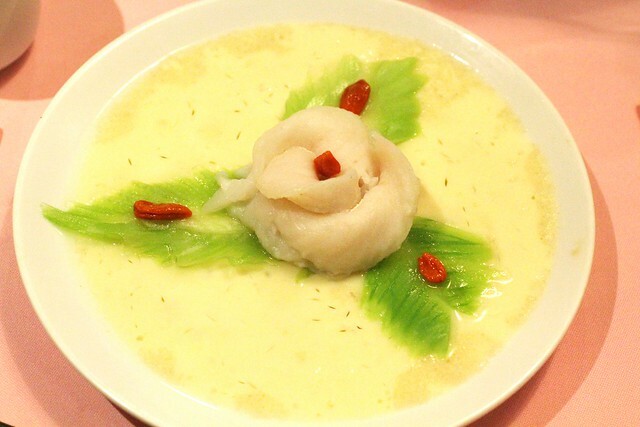 Each person was served their own plate of delicately steamed fish, a feminine flower with leaves carefully carved from mustard greens amidst a back-drop of egg custard, highlighted with goji. The textures were tender and smooth. A few at the table added salt, many added white pepper. Like several dishes, it wasn’t bad. It just didn’t excite. 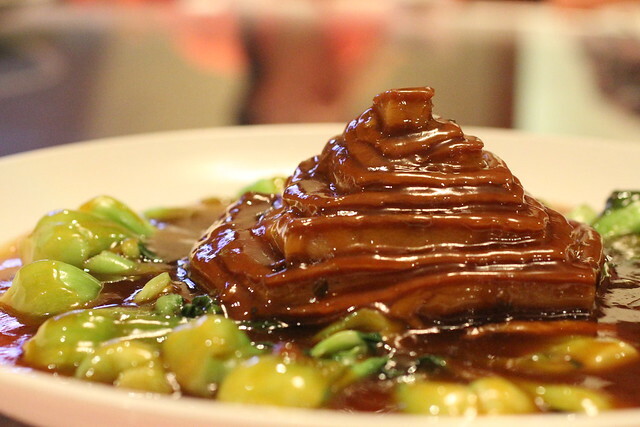 Then there was a well architect-ed pyramid of pork belly. After gazing at it, the plate was taken to the side and made into pork belly filled buns. They put the baby bok choy in too, in whole pieces, which just didn’t make sense. You couldn’t bite through the bun without pulling the whole piece of vegetable out. 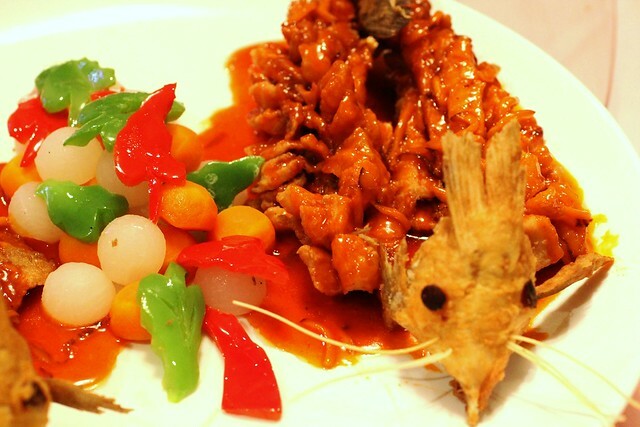 The chef made “Squirrel” Fish (a dish where fish is made to look like a squirrel’s tail) and created a fairly accurate squirrel head from fried fish head. The beautiful pepper leaves and balls of daikon serve no purpose in flavor, perhaps just blanched or boiled. The fried fish is fine yet not impressive in a mediocre sweet and sour sauce. The less impressive looking dishes seemed to fair better in taste. 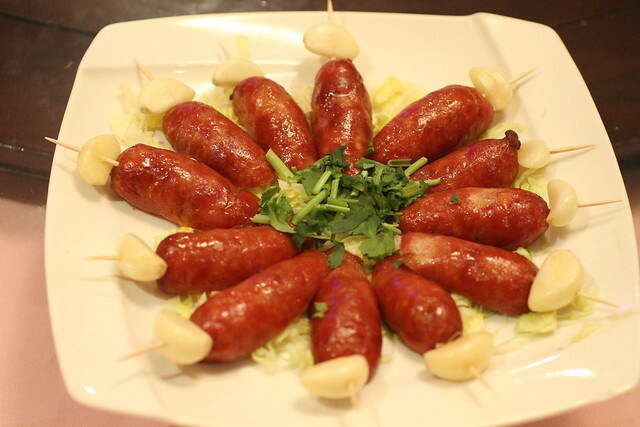 My favorite being the Taiwanese sausages skewered with a fresh garlic clove on the end. It’s important to alternate bites between the sweet and salty meat and nibbles of garlic that add the necessary punch. 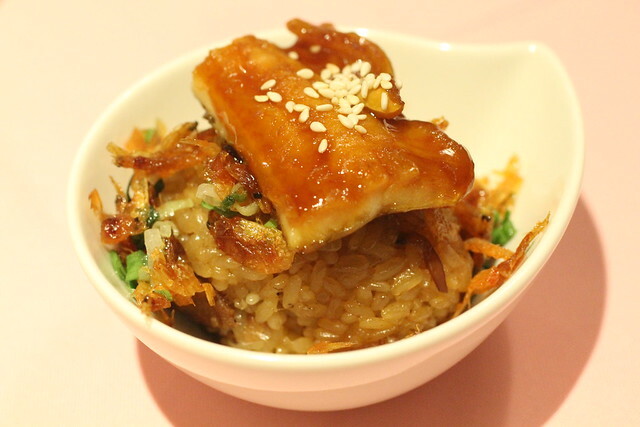 Other pretty good dishes include the Five Flavor Squid, the Meat Roll, Sea Cucumber with Shrimp Roe Sauce, Stir-Fry Noodles with Pork, and the Eel over Sticky Rice with Dried Shrimp (each person received an individual bowl). They were all just passable. The Fried Pig Intestine and Stinky Tofu really lacked depth of flavor. Come on! Stinky tofu? How do you even manage to mute that? 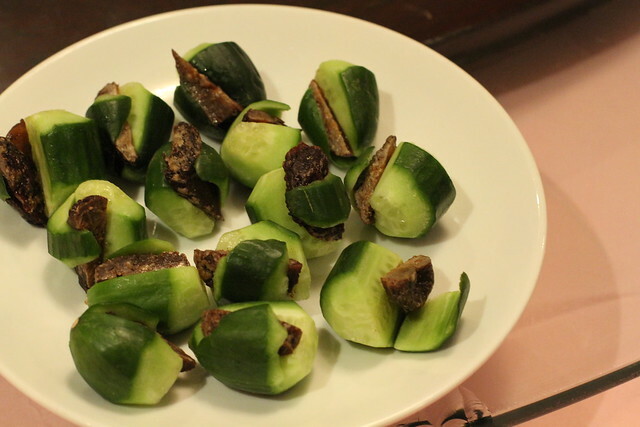 The cucumbers stuffed with plums to look like betelnuts is a cute idea but uninteresting to eat. All-in-all, pretty disappointing though it ended pretty well with a nice fruit plate and a giant sharing bowl of Taiwanese Shaved Ice. To their credit, 101 Taiwanese is one of the nicer looking restaurants in Flushing. It is not tacky and dirty. The price was insanely cheap at $500 (including the tip) for a table of ten people and way too much food. You’ll have to decide where your priorities lie. posted by jessica	at 08:36 AM	Filed under Asian, Restaurants. You can follow any responses to this entry through the RSS 2.0 feed. Both comments and pings are currently closed. maybe if suaces were used such as soy sauce the flavor could come out. any asian food i tried usually needed soy sauce or would be bland. I think you have a very biased Western palette. 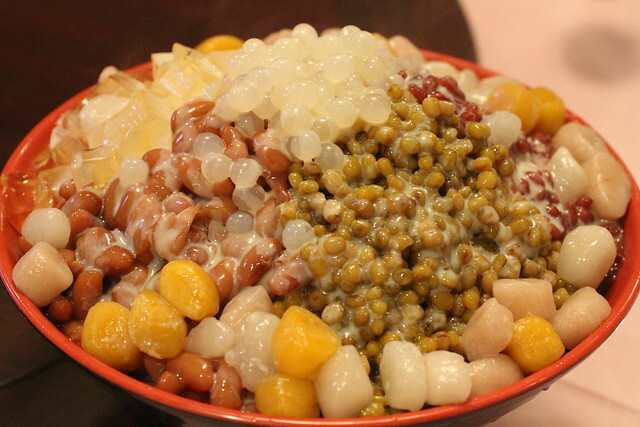 You’re food experiences were limited and did not hit the staples of Taiwanese cuisine. 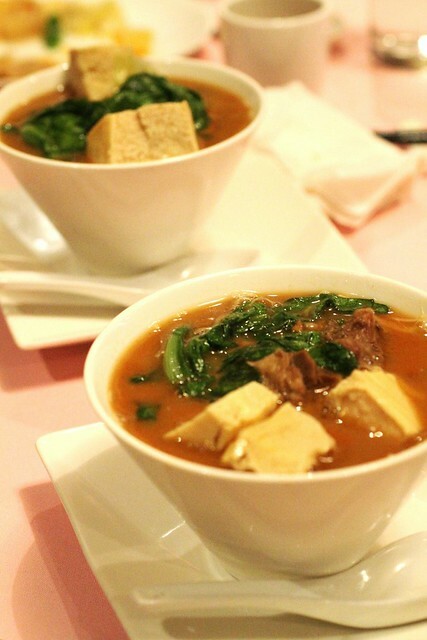 You were unfortunately unable to try some of the jewels Taiwan has to offer such as beef noodle soup and oyster omelet. What beautiful food preparation! Too bad the taste didn’t meet your expectations. I was wondering ! When you posted pics of the food – I thought “I didn’t like that place!” hahaha….yeah there is just too much better food for me to return there. It was better off as a hot pot spot. Anonymous, people always have to question “anonymous” comments when they are trying to question someone else’ credibility. As this was served as a more banquet style meal, we did not get to try beef noodle soup or oyster omelet (both dishes I love). If the restaurant had been pretty good/good enough, I would’ve gone back to try those and many other Taiwanese jewels (as you put it). Alas, the restaurant was really pretty darn bad. As for my “Western” palette, 6 of the people at the table were from Taiwan and also did not like your the food.